This article will be regularly updated with latest news, rumors and other updates regarding Samsung Galaxy Note 3. If you are one of those who are waiting for Samsung Galaxy Note 3, then keep checking this page regularly. Samsung Galaxy Note 3 will be launched on 4th September 2013. Like Samsung Galaxy Note 2, Note 3 might be launched at IFA show in September. This actually makes sense as Samsung Galaxy Note 2 was launched last year at IFA show. Above rumor seems to be confirmed. 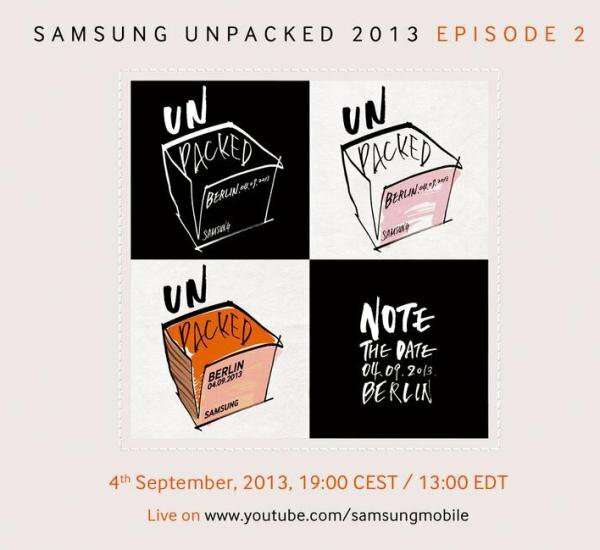 Samsung has sent invite for Samsung Unpacked event at IFA in Berlin all around the globe. If you look at the date mentioned 4-9-2013, you’ll probably make it out what Samsung Galaxy Note 3 will be surely unveiled at IFA Berlin. Read the text at the bottom right hand side of the invite, NOTE THE DATE. Looks like Samsung is confirming the rumors themselves. There were rumors that Samsung Galaxy Note 3 will be also called as Galaxy Mega. This was due to the expectation that screen of Samsung Galaxy Note 3 would be huge compared to other devices in market. But device named Samsung Galaxy Mega has been already launched. It’s a tablet which fits in your pocket. If we talk about screen size of Samsung Galaxy Note 3, this time Note 3 will come out of its tablet zone and will enter phablet category. According to latest information, Samsung Galaxy Note 3 will feature Full HD 5.99inch screen with display resolution of 1920 x1080. Samsung Galaxy Note 3 would have same dimensions as Samsung Galaxy Note 2 but will have relatively bigger display. Following the tradition of introducing some mind-blowing features in its releases, there are rumors that Samsung Galaxy Note 3 will feature an unbreakable OLED display. You always see funny gags of Samsung’s plastic phones. Even Samsung Galaxy S4 had a plastic chassis whereas its competitors had classy metal bodies, HTC One and Sony Xperia Z. According to source, Samsung might break their plastic phones tradition with Samsung Galaxy Note 3. Hopefully Samsung Galaxy Note 3 might feature full metal chassis. Samsung haters will die looking at it! 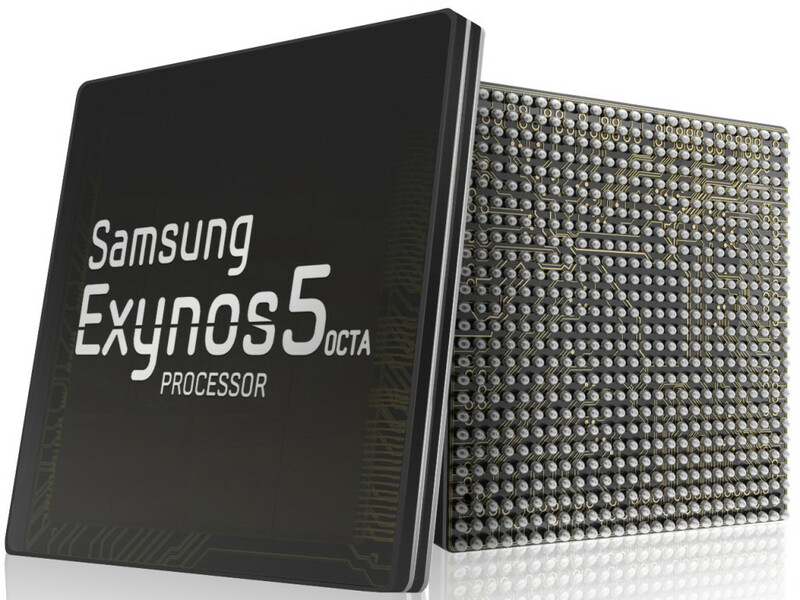 Samsung Galaxy Note 3 will run on Octa-Core Exynos 5 chip. Octa-Core stands for Eight Processor Cores. Older devices like Samsung Galaxy S3 and Samsung Note 2 used to run on Exynos 4 Quad-Core chips. Exynos 5 dual-core is running in Samsung made Google Nexus 10 tablet. Google Nexus 10 is high class in performance. So you can just imagine performance of Samsung Galaxy Note 3 which will be powered by Exynos 5 Octa-Core chip. Exynos 5 Octa-Core is a combination of Quad-Core 28nm 1.8 GHz ARM Cortex-A15 processor and 1.7Ghz Dual-Core Cortex A15 processor backed up 1.2Ghz Quad-Core Coretx A9 processor. Reason behind having two processors in one single device is explained by Samsung. It says processor will be activated according to the requirement and usage pattern. Say you want to just play music, make call, browse the Internet. For such activities, Cortex A9 will be used and Cortex A15 will be completely disabled. Cortex A15 will be only activated back when heavy requirement is needed, say HD games or some other heavy multitask job. Samsung claims, this will improve power efficiency by 70% when compared to Exynos 4 Quad-Core chip which was used in Samsung Galaxy S3 or Galaxy Note 2. According to sources Samsung Galaxy Note 3 will be launched in two variants, one with latest Exynos chip and another with Snapdragon 800 processor – as they did with Samsung Galaxy S4. Also one should not except that Samsung Galaxy Note 3 will be available with Octa core when made available in their region. When Exynos 5 CPU was launched with Samsung Galaxy S4, Standard Quad-Core processor was made available for UK. If Samsung is going to follow the pattern they had with Samsung Galaxy S4 then Cores in processor might differ from region to region. Maybe you’ll get fast Quad-Core processor rather than Octa-Core! There is huge possibility of Samsung Galaxy Note 3 being launched with 3GB of RAM. Samsung lately announced that they will manufacture devices which will come with 3GB RAM in the near future. And it’s likely to be possible that Samsung Galaxy Note 3 would become that first device from Samsung to have 3GB RAM. Picture taken from Samsung Galaxy Note 3 was leaked on Picasa. EXIF data shows 2322 x 4128 pixel resolution and was captured in 16:9 mode suggesting it is a 13 mega pixel camera. EXIF data also revealed Samsung Galaxy Note 3 camera will have f/2.2 aperture and 31mm lens. This is same as of Samsung Galaxy S4. Rumors about Optical Image Stabilization were floating all over Internet. Samsung Galaxy Note 3 will feature Samsung ORB. 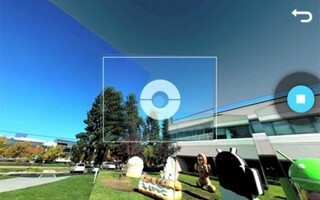 S Orb will work like Photo Sphere which can be found running on Android 4.2.2 (Galaxy Nexus, Nexus 4 and Nexus 7). Samsung’s S ORB will let you take multiple shots in 360degree arc. Notable difference between S ORB and Photo Sphere is that S ORB will be integrated with Facebook. There is no such option to directly upload images to Facebook in Photo Sphere. Price of Samsung Galaxy Note 3 is yet to be announced. Nor there are rumors or leaked information on Internet. Needless to say Samsung Galaxy Note 3 price won’t be low. You may expect the device to be ranged between $700 – 800. Well, we all are waiting for final remarks from Samsung or trusted source. 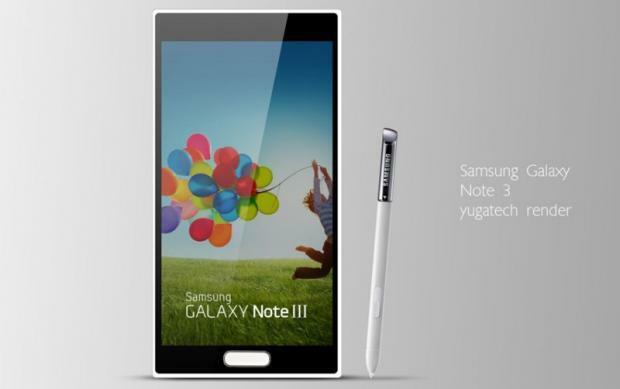 Keep checking this space for updated information regarding price of Samsung Galaxy Note 3. Looks like Samsung heard people’s cries ! (Launching a device with mettalic body instead its traditional plastic body.) By the way, will it get KEY LIME PIE ?